Well, after a bit of a Guitar-Hero induced hiatus, Alexander is back in the kitchen and better than ever! I convinced him that his adoring public needed to see him back in action - and it was also a way to get him involved in something other than annoying Sabrina and her friend. 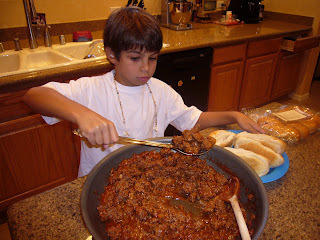 He decided to make Sloppy Joes - and I wanted a recipe that was easy to follow, and guaranteed delicious. 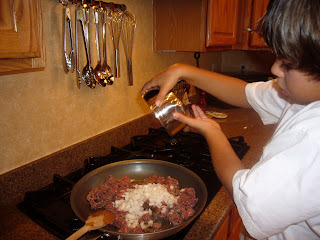 I've used Rachael Ray's recipe for Sloppy Joes before, and I always substitute ground beef for the turkey. The only way we like turkey around here is smothered in gravy with mashed potatoes. Simmer for 10 minutes, and serve! Yes, that pan is as big as it looks - it's a 14" skillet from Smart and Final. 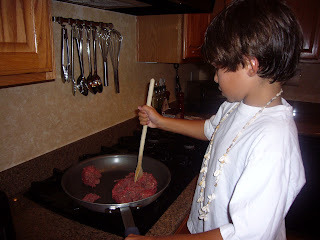 In a large saute pan, brown the ground beef. Add onion, and cook for several minutes on medium-high heat. 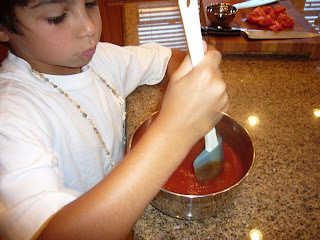 Mix together seasoning, tomato sauce, brown sugar, Worcestershire sauce and black pepper to taste. 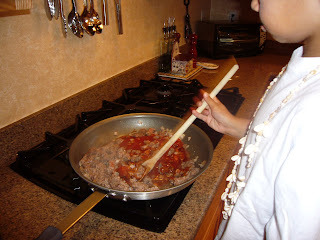 Pour sauce over meat, blend well, and simmer for 10 minutes, until sauce is thickened and bubbling. Great Job Alexander! This looks so much better than the kind that I buy in a can!